The Loon Ergo Bobbin fits nicely in hand. They say, "If it ain't broke, don't fix it." Despite the recent influx of premium bobbins, I've used only basic bobbins since I began tying flies at age 13. The spectrum of premium bobbins is vast. 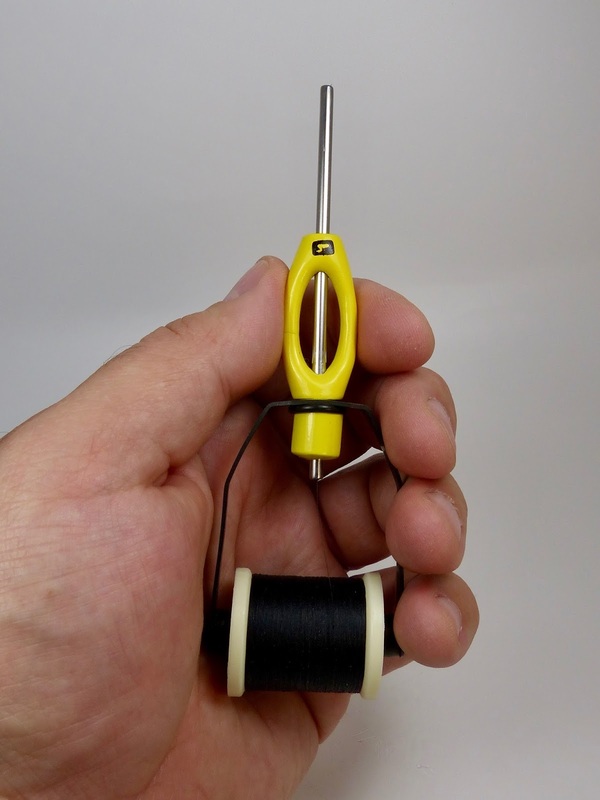 A standard Rite Bobbin costs about $25, while an Ekich Ultimate Bobbin can set the tyer back over $100. I usually don't spend more than $8 or so on a basic bobbin, but I decided to give the new Loon Outdoors Ergo Bobbin a shot. The Ergo Bobbins retails for $19.95. It doesn't offer any sort of fancy thread tension adjustment like the Rite or Ekich bobbins. In that sense, the Ergo Bobbin is more similar to a basic bobbin than what we consider a "premium bobbin." That's fine, I use my hand to fine tune thread tension when necessary (more on that later). What sets the Ergo Bobbin apart from other basic bobbins, as well as some premium models, is the shape of the handle. Instead of wrapping one's fingers around a fine metal tube, the tyer's fingers grip a wide yellow handle. I wasn't sure how much I'd like the handle, but I wound up loving it. I was amazed at how much more control I had over my thread when my hand was gripping the bobbin in a more natural position. I felt like I could lay down wraps of thread with more precision than I could with a standard bobbin. The Ergo Bobbin was just the right size for my hand. 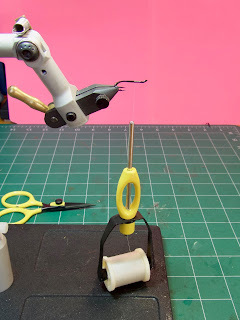 My thumb and index fingers grip the handle, while my pinky finger can rest on, or next to, the spool. Only 1 inch of thread separates the hook from the pedestal. There was one big "strike" against the Ergo Bobbin, however. Look at the picture above. Because the Ergo Bobbin is so long, there was very little room between the bottom of the bobbin and the top of my vise pedestal when the bobbin was perpendicular to the hook shank. This was a problem when securing materials such as an oval tinsel rib. After wrapping an oval tinsel tip or rib, I try to keep as much tension on the material as possible until I get about three tight wraps of thread over it. I tend to move the bobbin back and forth between hands to keep maximum tension on both the material and the thread. Because of this, I need more than 1" of thread out of the tip of the bobbin. Also, I need to be able to totally stop the spool from spinning, which I do by squeezing the spool between my pinky and my palm. Because of the length of the Ergo Bobbin, this was an impossible move when switching hands and trying to keep tension on the tinsel. The bobbin was too long and the vise's pedestal base kept getting in the way. This would cease to be an issue if I had more room between the vise head and the pedestal (or if I used a C-clamp instead of a pedestal). I've considered adding a 3" vise stem extension for a while, mainly to get the hook closer to my eye level. This should solve the Ergo Bobbin length "problem." However, it might be nice to have the option of buying a smaller, "midge" sized Ergo Bobbin for when I need more clearance. In all, the positives far outweighed the negatives. The enhanced thread control was so noticeable, I figure I can devise a solution for the above problem. The Ergo Bobbin is noticeably more comfortable than any other bobbin I've ever used. The Ekich S-Bobbin looks quite comfortable, too. But for a quarter of the price, I think I will stick with Loon's Ergo Bobbin. This is the first "nice" bobbin I've purchased and so far I'm happy with it. I have a DynaKing pedestal vice which may be a bit taller than yours (Renzetti? ), plus the jaws extend past the pedestal base. I'd love to see what tools you use specifically for tubes, as I'm new to tying them. Thanks for sharing your knowledge, I'm learning a lot here! Yeah, I have a Renzetti Master. Unlike your DK, the Master jaws don't extend past the pedestal base. I guess I could always turn the vise sideways. I'll probably just get the stem extension though. I'll post some tube tool info for you next Monday. The vast majority of my tube tying is done on a tapered needle. You don't really need to make a very big investment.